Copyright © 2013 Kira Logvinova. This is an open access article distributed under the Creative Commons Attribution License, which permits unrestricted use, distribution, and reproduction in any medium, provided the original work is properly cited. The problem of deriving the governing equations of spreading matters in porous media, derived under different propositions was considered in [1-3]. Thus in , we thoroughly used the fact that centered Gaussian processes are completely determined by the (two points) correlation function. A multipoint correlation appears when a linear fixed-point equation is averaged. That each of these correlations splits into a finite (but increasing with the number of points) number of products of correlation functions was quite important for us. It is possible to use the diagrammatic method with more general processes . Then we have much more terms in the expansions. Even if we replace the coefficients of the fixed-point equation for u by functions of a centered Gaussian process, the method is not of a simple use. It is possible to obtain similar results via a variational method, which we will explain for the example of problem, already considered in [1,2]. Not surprisingly, we then will retrieve the already obtained macroscopic equation. 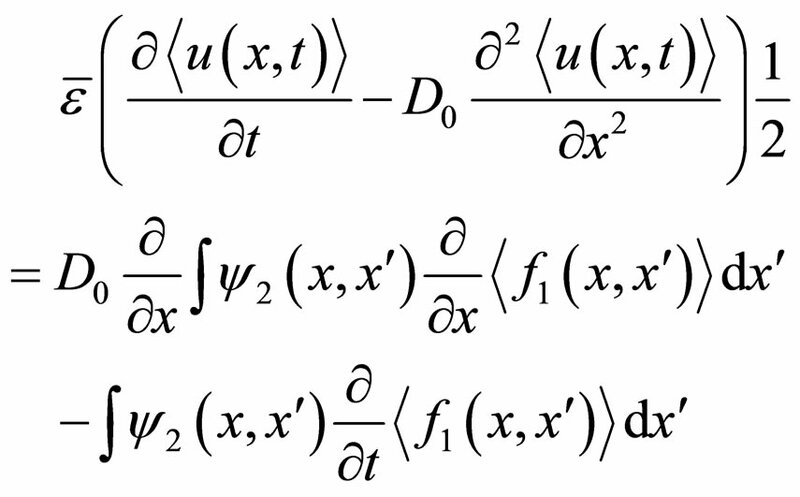 Then, we will use the variational method for a variant of equation including functions of a centered Gaussian process. The idea goes back to so-called variational (functional) derivatives . This is again a functional with respect to that depends on the couple of parameters and so on. and this is very convenient for differentiation procedure. 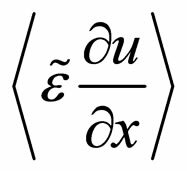 where functional shift operator is understood in the sense of expansion over infinite integration limits. We should have written here “and so on”, since after that we should take the functional derivative over and then average the obtained equations over the realizations of and apply Furutsu-Novikov’s formula again. As a result, we would obtain an equation for . Iteratively using the procedure would lead us to an infinite system of equations for the sequence of functions , if we set . The structure of the thus obtained equations is such that the k-th equation in the hierarchy, with unknown on the left hand-side has , , and the concentration in its right hand-side. And we are led to set the natural question “When can we break this chain of equations?”. It turns out that under quite reasonable assumptions, this problem can be solved. Indeed, we have > since the initial concentration is determined and independent of . 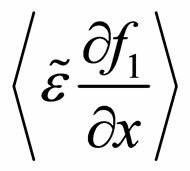 In order to give the integrals on the right hand-side of (6) a concrete meaning, we now specialize the Gaussian process by assigning a definite expression to its correlation function. Let us assume that the random field is homogeneous and isotropic. Then, without any concrete definition of the correlation function , let us note that the latter depends only on the modulus of its arguments’ difference . Our ultimate aim is to derive an equation related only to the mean concentration . The procedure of getting such as equation seems evident. It is clearly seen from (7) that are generated by the concentration that appears in the right-hand part of this equation. The function can be found using the Green’s function of operator . 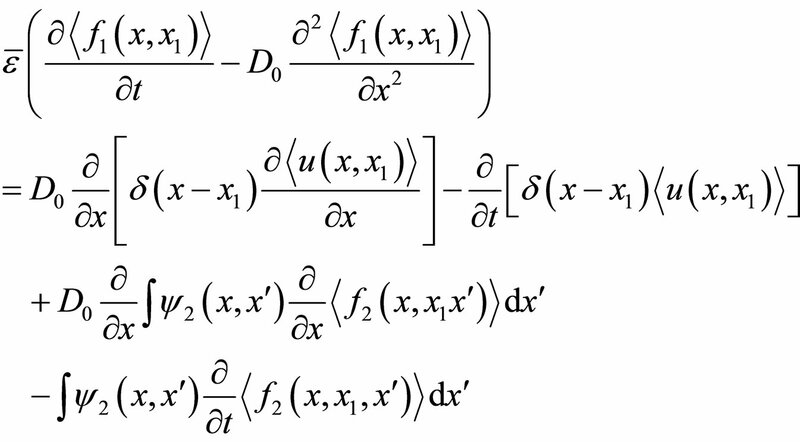 Then, after substituteing the obtained solution for into (6), we get the final integro-differential equation for . Hence successive approximation method and functional derivative method lead us to similar results for problems such that both methods are available. 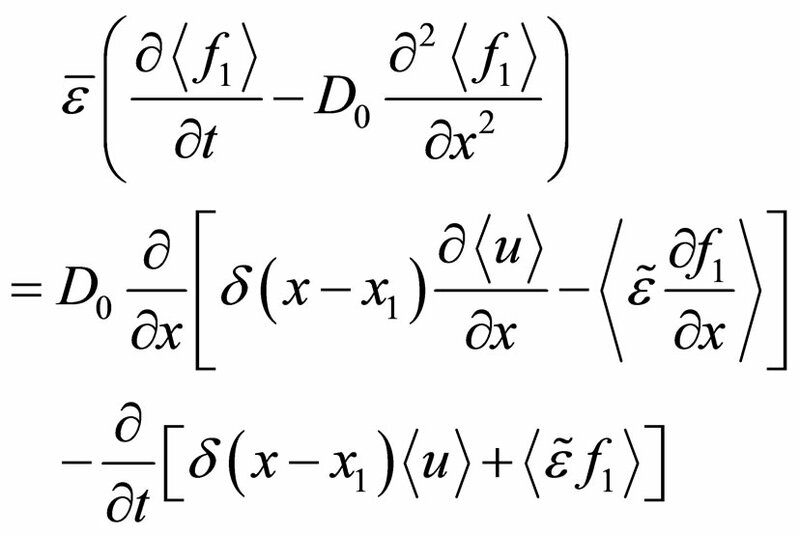 So, in this paper, we presented an example of how to use the notion of a functional derivative in order to arrive at a macroscopic equation for dispersion in disordered media. In fact, we also used the present method for equation, which had been derived for a different type of disordered medium, made of inter-twisted tubes, such that a onedimensional approach has physical meaning. Hence, the example can only serve formally for two reasons. Indeed, the sample paths of Gaussian processes can take negative values, which are not good when the existence of solutions is needed. 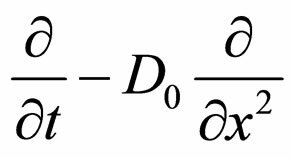 The drawback can be removed by considering ε being replaced by the exponential of a Gaussian process. We will not do it, but the presented method works fairly well for this case and gives the results already obtained via Feynman diagrams in our work .